Mathematics – Vedic literature is replete with concepts of zero, the techniques of algebra and algorithm, square root and cube root. Arguably, the origins of Calculus lie in India 300 years before Leibnitz and Newton. Astronomy – Rig Veda (2000 BC) refers to astronomy. Physics – Concepts of atom and theory of relativity were explicitly stated by an Indian Philosopher around 600 BC. Chemistry – Principles of chemistry did not remain abstract but also found expression in distillation of perfumes, aromatic liquids, manufacturing of dyes and pigments, and extraction of sugar. Medical science & surgery – Around 800 BC, first compendium on medicine and surgery was complied in ancient India. Fine Arts – Vedas were recited and recitation has to be correct, which gave rise to a finer study of sound and phonetics. The natural corollary were emergence of music and other forms of performing arts. Mechanical & production technology – Greek historians have testified to smelting of certain metals in India in the 4th century BC. Civil engineering & architecture – The discovery of urban settlements of Mohenjodaro and Harappa indicate existence of civil engineering & architecture, which blossomed to a highly precise science of civil engineering and architecture and found expression in innumerable monuments of ancient India. Shipbuilding & navigation – Sanskrit and Pali texts have several references to maritime activity by ancient Indians.Sports & games – Ancient India is the birth place of chess, ludo, snakes and ladders and playing cards. Mathematics represents a very high level of abstraction attained by human brain. In ancient India, roots to mathematics can be traced to Vedic literature, which are around 4000 years old. Between 1000 BC and 1000 AD, a number of mathematical treatises were authored in India. Will Durant, American historian (1885-1981) said that India was the mother of our philosophy of much of our mathematics. It is now generally accepted that India is the birth place of several mathematical concepts, including zero, the decimal system, algebra and algorithm, square root and cube root. Zero is a numeral as well as a concept. It owes its origin to the Indian philosophy which had a concept of ‘sunya’, literal translation of which is ‘void’ and zero emerged as a derivative symbol to represent this philosophical concept. Geometrical theories were known to ancient Indians and find display in motifs on temple walls, which are in many cases replete with mix of floral and geometric patterns. The method of graduated calculation was documented in a book named “Five Principles” (Panch-Siddhantika) which dates to 5th Century AD.A. L. Basham, an Australian Indologist, writes in his book, The Wonder That was India that “… the world owes most to India in the realm of mathematics, which was developed in the Gupta period to a stage more advanced than that reached by any other nation of antiquity. The success of Indian mathematics was mainly due to the fact that Indians had a clear conception of the abstract number as distinct from the numerical quantity of objects or spatial extension. Algebraic theories, as also other mathematical concepts, which were in circulation in ancient India, were collected and further developed by Aryabhatta, an Indian mathematician, who lived in the 5th century, in the city of Patna, then called Pataliputra. 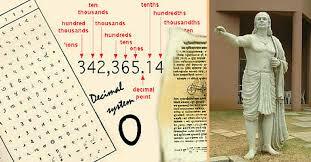 He has referred to Algebra (as Bijaganitam) in his treatise on mathematics named Aryabhattiya. Another mathematician of the 12th century, Bhaskaracharya also authored several treatises on the subject – one of them, named Siddantha Shiromani has a chapter on algebra. He is known to have given a basic idea of the Rolle’s theorum and was the first to conceive of differential calculus. In 1816, James Taylor translated Bhaskaracharya’s Leelavati into English. Another translation of the same work by English astronomer Henry Thomas Colebruke appeared next year in 1817. The credit for fine-tuning and internationalizing these mathematical concepts – which had originated in India – goes to the Arabs and Persians. Al-Khawarizmi, a Persian mathematician, developed a technique of calculation that became known as “algorism.” This was the seed from which modern arithmetic algorithms have developed. Al-Khwarizmi’s work was translated into Latin under the title Algoritmi de numero Indorum, meaning The System of Indian Numerals. A mathematician in Arabic is called Hindsa which means from India. The 14th century Indian mathematician Madhava of Sangamagrama, along with other mathematicians of the Kerala school, studied infinite series, convergence, differentiation, and iterative methods for solution of non-linear equations. Jyestadeva of the Kerala school wrote the first calculus text, the Yuktibhasa, which explores methods and ideas of calculus repeated only in seventeenth century Europe. The Pleiades hold a prominent place as the mothers or wet nurses of the newborn infant in one of the most ancient and central Hindu myths, that of the birth of the war-god Rudra/Skanda, who evidently represents, among other things, the victorious rising sun (and as vernal sun the new year). The Pleiades are said to have been the wives of the seven sages, who are identified with the seven stars of the Great Bear. The Great Bear’s Old Tamil name elu-meen ‘seven-star’ corresponds to the combination of the pictograms ‘7’ + ‘fish’, which alone constitutes the entire text of one finely carved Indus seal. The Satapatha-Brahmana states that the six Pleiades were separated from their husbands on account of their infidelity; other texts specify that only one of the seven wives, Arundhati, remained faithful and was allowed to stay with her husband: she is the small star Alcor in the Great Bear, pointed out as a paradigm of marital virtue to the bride in the Vedic marriage ceremonies. Evidence for the Harappan origin of this myth is provided, among other things, by Indus seals which show a row of six or seven human figures; their female character is suggested by the one long plait of hair, which to the present day has remained characteristic of the Indian ladies. The root to the concept of atom in ancient India is derived from the classification of material world in five basic elements by ancient Indian philosophers. These five ‘elements’ and such a classification existed since the Vedic times, around 3000 BC before. These five elements were the earth (prithvi), fire (agni), air (vayu), water (jaal) and ether or space (aksha). These elements were also associated with human sensory perceptions: earth with smell, air with feeling, fire with vision, water with taste and ether/space with sound. Later on, Buddhist philosophers replaced ether/space with life, joy and sorrow. From ancient times, Indian philosophers believed that except ether or space, all other elements were physically palpable and hence comprised of small and minuscule particles of matter. They believed that the smallest particle which could not be subdivided further was paramanu (can be shortened to parmanu), a Sanskrit word. Paramanu is made of two Sanskrit words, param meaning ultimate or beyond and anu meaning atom. Thus, the term “paramanu” literally means ‘beyond atom’ and this was a concept at an abstract level which indicated the possibility of splitting atom, which is now the source of atomic energy. The term “atom” however should not be conflated with the concept of atom as it is understood today. Kanada, a 6th century, Indian philosopher was the first person who went deep systematically in such theorization. Another Indian, philosopher Pakudha Katyayana, who was a contemporary of Buddha, also propounded the ideas about the atomic constitution of the material world. All these were based on logic and philosophy and lacked any empirical basis for want of commensurate technology. Similarly, the principle of relativity (not to be confused with Einstein’s theory of relativity) was available in an embryonic form in the Indian philosophical concept of ‘sapekshavad’, the literal translation of this Sanskrit word is theory of relativity. These theories have attracted attention of the Indologists, and veteran Australian Indologist A. L. Basham has concluded that they were brilliant imaginative explanations of the physical structure of the world, and in a large measure, agreed with the discoveries of modern physics. Ancient India’s development in chemistry was not confined at an abstract level like physics, but found development in a variety of practical activities. In any early civilization, metallurgy has remained an activity central to all civilizations from the Bronze Age and the Iron Age, to all other civilizations that followed. It is believed that the basic idea of smelting reached ancient India from Mesopotamia and the Near East. Coinage dating from the 8th Century B.C. to the 17th Century A.D. Numismatic evidence of the advances made by smelting technology in ancient India. Nataraja the God of Dance is made of five metals Pancha-Dhatu. In the 5th century BC, the Greek historian Herodotus has observed that Indian and the Persian army used arrows tipped with iron. Ancient Romans were using armor and cutlery made of Indian iron. In India itself, certain objects testify to the higher level of metallurgy achieved by the ancient Indians. By the side of Qutub Minar, a World heritage site, in Delhi, stands an Iron Pillar. The pillar is believed to be cast in the Gupta period around circa 500 AD. The pillar is 7.32 meters tall, tapering from a diameter of 40 cm at the base to 30 cm at the top and is estimated to weigh 6 tonnes. It has been standing in the open for last 1500 years, withstanding the wind, heat and weather, but still has not rusted, except very minor natural erosion. This kind of rust proof iron was not possible till iron and steel was discovered few decades before. The advance nature of ancient India’s chemical science also finds expression in other fields, like distillation of perfumes and fragment ointments, manufacturing of dyes and chemicals, polishing of mirrors, preparation of pigments and colours. Paintings found on walls of Ajanta and Ellora (both World heritage sites) which look fresh even after 1000 years, also testify to the high level of chemical science achieved in ancient India. Ayurveda as a science of medicine owes its origins in ancient India. Ayurveda consists of two Sanskrit words – ‘ayur’ meaning age or life, and ‘veda’ which means knowledge. Thus, the literal meaning of Ayurveda is the science of life or longevity. Ayurveda constitutes ideas about ailments and diseases, their symptoms, diagnosis and cure, and relies heavily on herbal medicines, including extracts of several plants of medicinal values. This reliance on herbs differentiates Ayurveda from systems like Allopathy and Homeopathy. Ayurveda has also always disassociated itself with witch doctors and voodoo. Ancient scholars of India like Atreya, and Agnivesa have dealt with principles of Ayurveda as long back as 800 BC. Their works and other developments were consolidated by Charaka who compiled a compendium of Ayurvedic principles and practices in his treatise Charaka-Samahita, which remained like a standard textbook almost for 2000 years and was translated into many languages, including Arabic and Latin. ‘Charaka-Samahita’ deals with a variety of matters covering physiology, etiology and embryology, concepts of digestion, metabolism, and immunity. Preliminary concepts of genetics also find a mention, for example, Charaka has theorized blindness from the birth is not due to any defect in the mother or the father, but owes its origin in the ovum and the sperm. In ancient India, several advances were also made in the field of medical surgery. Specifically these advances icluded areas like plastic surgery, extraction of catracts, and even dental surgery. Roots to the ancient Indian surgery go back to at least circa 800 BC. Shushruta, a medical theoretician and practitioner, lived 2000 years bebore, in the ancient Indian city of Kasi, now called Varanasi. He wrote a medical compendium called ‘Shushruta-Samahita. This ancient medical compendium describes at least seven branches of surgery: Excision, Scarification, Puncturing, Exploration, Extraction, Evacuation, and Suturing. The compendium also deals with matters like rhinoplasty (plastic surgery) and ophthalmology (ejection of cataracts). The compendium also focuses on the study the human anatomy by using a dead body. In ancient India Medical Science supposedly made many advances. Specifically these advances were in the areas of plastic surgery, extraction of cataracts, and dental surgery. There is documentary evidence to prove the existence of these practices. An artist’s impression of an operation being performed in ancient India. In spite of the absence of anesthesia, complex operations were performed. The practice of surgery has been recorded in India around 800 B.C. This need not come as a surprise because surgery (Shastrakarma) is one ofthe eight branches of Ayurveda the ancient Indian system of medicine. The oldest treatise dealing with surgery is the Shushruta Samahita (Shushruta’s compendium). Shusruta who lived in Kasi was one of themany Indian medical practitioners who included Atraya and Charaka. He was one of the first to study the human anatomy. In the Shusruta, Samahita he has described in detail the study of anatomy withthe aid of a dead body. Shusruta’s forte was rhinoplasty (Plastic surgery)and ophthalmialogy (ejection of cataracts). Shushruta has described surgery under eight heads Chedya (excision), Lekhya (scarification),Vedhya (puncturing), Esya (exploration), Ahrya (extraction), Vsraya (evacuation) and Sivya (Suturing). India’s urban civilization is traceable to Mohenjodaro and Harappa, now in Pakistan, where planned urban townships existed 5000 years before. From then onwards, the ancient Indian architecture and civil engineering continued to develop and grow. It found manifestation in construction of temples, palaces and forts across the Indian peninsula and the neighbouring regions. In ancient India, architecture and civil engineering was known as sthapatya-kala, literal translation of which means the art of constructing (something). During the periods of Kushan Empire and Maurya empires, the Indian architecture and civil engineering reached to regions like Baluchistan and Afghanistan. Statues of Buddha were cut out, covering entire mountain faces and cliffs, like Buddhas of Bamiyan, Afghanistan. Over a period of time, ancient Indian art of construction blended with Greek styles and spread to Central Asia. On the other side, Buddhism took Indian style of architecture and civil engineering to countries like Sri Lanka, Indonesia, Malaysia, Vietnam, Laos, Cambodia, Thailand, Burma, China, Korea and Japan. Angkor Wat is a living testimony to the contribution of Indian civil engineering and architecture to the Cambodian Khmer heritage in the field of architecture and civil engineering. In mainland India of today, there are several marvels of ancient India’s architectural heritage, including World heritage sites like Ajanta, Ellora, Khajuraho, Mahabodhi Temple, Sanchi, Brihadisvara Temple and Mahabalipuram. Mechanical and production technology of ancient India ensured processing of natural produce and their conversion into merchandise of trade, commerce and export. A number of travelers and historians (including Megasthanes, Ptolemy, Faxian, Xuanzang, Marco Polo, Al Baruni and Ibn Batuta) have indicated a variety of items, which were produced, consumed and exported around that society’s “known world” by the ancient Indians. A panel found in Mohenjodaro depicts a sailing craft, and thousands of years later Ajanta murals also depict a sea-faring ship. The science of shipbuilding and navigation was well known to ancient Indians. Sanskrit and Pali texts are replete with maritime references, and ancient Indians, particularly from the coastal regions, were having commercial relations with several countries of across the Bay of Bengal like Cambodia, Java, Sumatra, Borneo, and even up to China. Similar maritime and trade relations existed with countries across the Arabian Sea like Arabia, Egypt and Persia. Even around circa 500 AD, sextants and mariner’s compass were not unknown to ancient Indian shipbuilders and navigators. J.L. Reid, a member of the Institute of Naval Architects and Shipbuilders, England, at around the beginning of the 20th century has got published in the Bombay Gazetteer that “The early Hindu astrologers are said to have used the magnet, in fixing the North and East, in laying foundations, and other religious ceremonies. The Hindu compass was an iron fish that floated in a vessel of oil and pointed to the North. The fact of this older Hindu compass seems placed beyond doubt by the Sanskrit word ‘Maccha-Yantra’, or ‘fish-machine’, which Molesworth gives as a name for the mariner’s compass”.